The Big Bad Wolf has come to Storybrooke. Last season we learned that Little Red Riding Hood (Meghan Ory) and the Big Bad Wolf were one and the same. With the spell broken, Red – aka Ruby (her Storybrooke name) – once again turns into a killer werewolf when the moon is full. Of course, Ruby doesn’t want to be bad, but like Dr. Jekyll and Mr. Hyde or The Incredible Hulk, she can’t control her dark side. 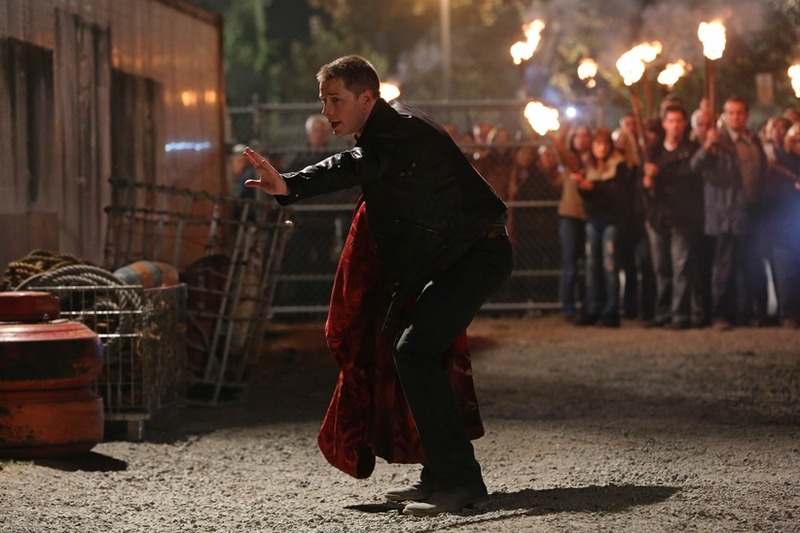 Once Upon a Time’s seventh episode, “Child of the Moon,” plays on the classic themes of good vs. evil and dualism. Ruby’s backstory is interesting, and this episode was entertaining, though I couldn’t help wondering what was going on with the primary characters while it was being told. As the full moon rises over Storybrooke, Ruby is terrified of her true nature. Not only does she know she is a werewolf, but so do the townsfolk. When her attempts at caging herself fail, and a Storybrooke citizen (a minor character who had been a mouse in Fairytale Land) is murdered, a lynch mob is out for her blood. The mob is easily swayed of Ruby’s guilt by the villainous Albert Spencer/King George (Alan Dale). 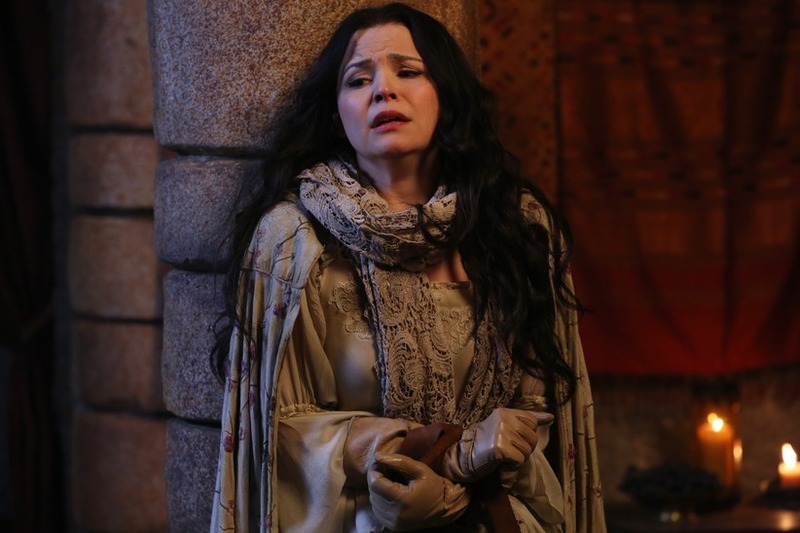 It was nice to see more of the people of Storybrooke and their reaction to an aftereffect of the curse being broken. David/Charming (Josh Dallas) and Belle (Emilie de Ravin) are the only ones certain Ruby is more good than bad. So while it’s cool David stands up for his convictions, but now that he knows he is Charming he always makes the right decision. His eternal goodness makes him a bit bland. He was actually more interesting when he was torn between his Storybrooke wife and Mary-Margaret/Snow (Ginnifer Goodwin). The Storybrooke sequences are intertwined with Ruby’s life as Red Riding Hood in Fairytale Land. When she was there, she had learned to control her wolf side, but in Storybrooke that control was forgotten. Back in Fairytale Land she discovered she was not alone in her wolfness. She actually belonged to a pack led by her long-lost mother, Anita (Annabeth Gish). Anita wants Red to join the pack, but when Red is ordered to kill her friend Snow, she realizes she is not ready to let go of her human side. Though Red’s story was engaging, the outcome was too easy to see coming given no wolf pack counterparts were introduced either in Storybrooke or in the uncursed Fairytale Land. Maybe a lone wolf survivor would have given a little ambiguity to the fate of the others. The Ruby/Red Riding Hood storyline dominated the episode. A little time was given to the mysterious dream shared by Henry (Jared Gilmore) and Aurora (Sarah Bolger). David takes Henry to the only person he thinks can help – Mr. Gold (Robert Carlyle). Mr. Gold explains that the sleeping curse is causing the nightmares and gives Henry a talisman that will help his control the dreams. This offered some added interest to the story. Is Mr. Gold just being kind and generous to young Henry or does he know about Aurora/Sleeping Beauty’s nightmares? It’s hard to say whether he knows about the shared dreams, and maybe he does have a tiny soft spot for kids, but I don’t believe he had no ulterior motives for helping Henry. Maybe he really doesn’t want to see Henry in distress, but he also wants to find his own son. He is looking for a way around what is basically a new curse, and Henry’s dreams may be the key. Henry’s dreams may be the connection to the world of magic, and I’m sure Mr. Gold will take advantage of that when he can.